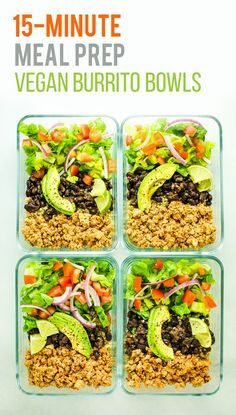 This tofu burrito bowl recipe is loaded with flavor and packed with protein, fiber, and good fats. It comes together in under 15 minutes and it's perfect for healthy meal prep. • Greens – romaine, spinach, kale, etc. • Drain tofu. Remove as much excess liquid as possible by pressing between paper towels. • In a large skillet, heat oil to medium and add the block of tofu. Use a spoon or spatula to “chop” the tofu. Add seasonings and continue “chopping” and stirring until all of the tofu is seasoned. • Cook 8-10 minutes, until tofu is heated throughout. • Portion tofu into meal prep containers (or into bowls if you’re eating it now!) and add desired toppings. • Store in the fridge up to 10 days.